We shot 1080p video samples with the four phones one after the other to ensure the lighting conditions are the same. We'll also have a look at what the Video Quality Compare tool has to show us. The Samsung Galaxy S III videos came out a bit overexposed (which lead to some loss of detail). There's still have a fair amount left, they were the only ones with some detail left in the dark shadow under the bush, colors are accurate (but a bit washed out due to the exposure) and they look pretty unprocessed. The HTC One X the LG Optimus 4X HD on the other hand push the contrast and saturation up quite a bit. The One X is no where close when it comes to the red umbrellas, while the 4X HD offers more accurate colors but pretty heavy sharpening too. The Meizu MX 4-core captured pretty good detail, but there's a yellow tint (same as in the still photos). Looking beyond the quality of static frames from the videos, we have to point out a few things that become noticeable when you watch the videos play. The LG Optimus 4X HD constantly hunts for focus, making most (if not all) of its videos unusable as the image is out of focus every three seconds and there's no way to disable that feature. Update, August 8: We updated the LG Optimus 4X HD with a new software and re-focusing is much less common now. It's actually on the verge of being slow to act as it takes a couple of seconds after a major change in the scene. Regardless, this update really improves the video camera performance on the 4X HD. Then comes the HTC One X, which shoots videos at 24fps (unlike the other three which hit 30fps). Its videos are choppier than the others due to the lower framerate. 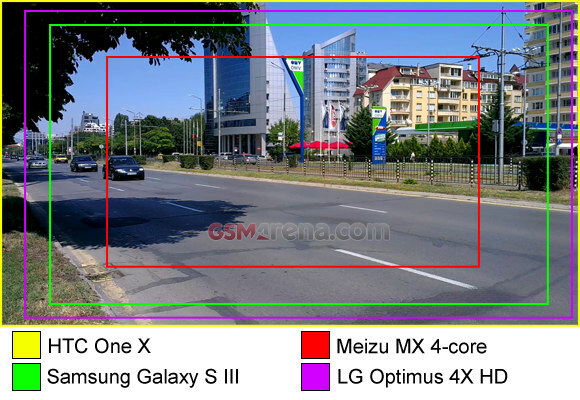 The Meizu MX 4-core offered a pretty narrow field of view, meaning you'll have to take a step back if you want to fit everything in the frame (that would otherwise fit with the other three). Here's an illustration that shows the difference in FoV. The HTC Once again has the widest field of view. 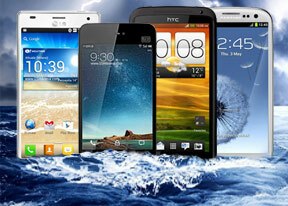 With the LG Optimus 4X HD and the Samsung Galaxy S III come between it and the Meizu. Finally, the Samsung Galaxy S III went a bit over the top with the exposure, so you might need to manually tone it down if you're shooting video on a bright sunny day. You can watch the video samples from the four phones on YouTube. Don't forget to pick 1080p and view the videos in fullscreen. 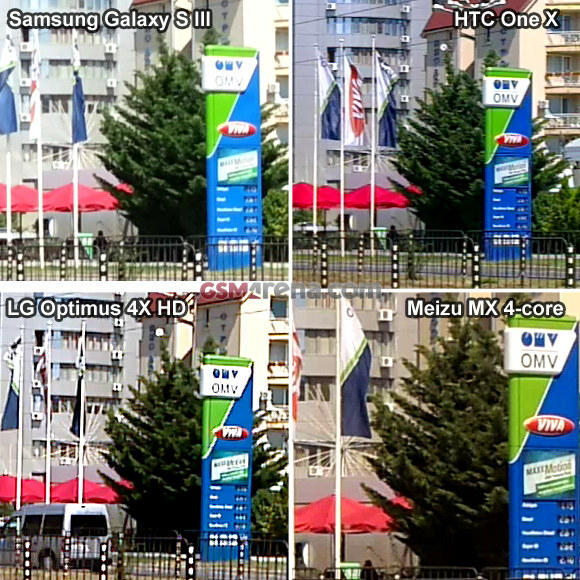 Moving on to the Video Compare tool, the Samsung Galaxy S III comes out on top in terms of detail captured. The Meizu MX 4-core edges out the other two competitors and comes in second, even though there are some noticeable compression artifacts. The HTC One X video has detail in one area of the frame but is soft in another area. Some compression artifacts are visible. The same goes for the LG Optimus 4X HD - the bitrate isn't quite enough. The frame is evenly sharp, but there's noticeable oversharpening. In the end, it's the Samsung Galaxy S III that comes out on top - it's not perfect, but it's the best of the four. The HTC One X keeps plenty of detail, considering it has the widest FoV, but its videos are slightly choppy and it botches the color rendering. It did make up quite some ground in low-light shooting though. The Meizu MX 4-core again shows potential, but the narrow FoV and washed out colors work against it. As for the LG Optimus 4X HD, it's much easier to get a usable video out of it after the update, but videos still look over-processed.